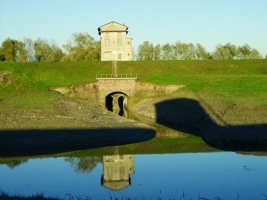 A legend tells of Baricello's wife who fell into the Savena River and escaped uninjured. The miracle was credited to the Virgin of the Guazzanella venerated in the near church, which was named after that the Madonna of Barisella. The earliest documents referring to Baricella date back to the first half of the 15th-century. Its name comes from the "bargelli", officials in charge of policing and fiscal controls on the ancient course of the River Savena, once a crossroads for trade with the neighbouring territory of Ferrara. It is worth visiting the 18th-century Church of Santa Maria di Baricella, whose origins date back to the 16th-century. Inside there is a valuable early 17th-century wooden crucifix, believed by the faithful to be miraculous - in cases of calamity, it used to be exhibited or carried in procession. At the eastern limit of the town, the Oratory of San Marco is a beautiful brick building with neo-medieval terracotta decorations and the interior completely painted with frescoes celebrating Cavaliere Zucchini (whose ashes have been kept here since 1905), an important figure in the modernization of agriculture in these lands. In the area of Boschi, there is the Church of Santa Maria Lauretana , containing a beautiful wooden Madonna clothed in fabrics from the time of the original construction, the 17th-century, substituted in the 19th-century by the present building. Near the village of San Gabriele, it is also worth noting the Church of Santa Maria del Corniolo , where survive two frescoes, believed to be the work of Amico Aspertini, who was working in the same period on the decoration of the Rocca Isolani in Minerbio. It is also worth visiting the Ecological Readjustment Area of Baricella , created by the Town Council in the grounds of the Reale Collegio di Spagna, where environmental education activities are organised. As well as numerous species of birds, there is also the chance to see the rare marsh tortoise. Fior di Fiera: 2nd Sunday of May.